What does “successful wedding day photography” even mean anyway? Does it simply mean hiring someone to take a predesigned list of photos for your wedding day? Or does it mean the entire process of obtaining those beautiful images was part of the success of your wedding day photography? See where I’m going here? First meetings, planning and communication, organization of the wedding day’s timeline, and even the mood and personality of the photographer during the day all play a huge role in the success of the photography on your wedding day. Choosing the right wedding photographer is so much more than pretty pictures. Yes, you should ultimately receive compelling and beautiful photos as that IS the deliverable you are paying for – this is a given. But what if the ‘experience’ of taking those pictures was less than beautiful? Will you look at those images for the rest of your life with fondness and smiles? Probably not. Let’s break down some things to think about with successful wedding photography. It should go without saying your photographer should have the minimum basic equipment to make your wedding day photography successful. This equates to more than a ‘fancy camera’ and a good eye. This is a good start, but an experienced photographer should have a backup to the backup (at least! ), a wide array of professional quality lenses, a variety of both on and off-camera lighting options, memory and battery backup, and in most scenarios, an assistant to help organize the equipment and people. 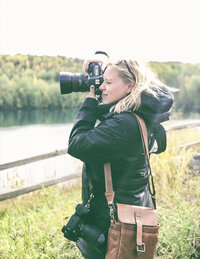 In addition to the equipment basics, your professional photographer should also be prepared for a variety of weather scenarios and come with props to deal with any less-than-ideal conditions. Lastly, your photographer should be equipped with the right business licenses, insurance, and loads of experience with references. I rank communication as one of the most important components of successful wedding day photography. I like to meet with my couples a handful of times before the big day. This allows us to get to know each other, find out what expectations we each have of each other, and to dig deep into discovering out what it is you are looking for in the way of photography. Some couples are all about the candid, whimsical-smoochie kind of photos, and some want more formal portraits. Most want a hybrid of the two. Above and beyond these meetings, I encourage an open dialog with my couples so when the big day comes – we know each other WELL. It’s an emotional, intimate, exhausting, exciting, crazy day! It’s a lot more meaningful when the photographer tagging along with the two of you is someone you enjoy being around and is invested in your relationship and wedding celebration. Fact: I cry at all my couple’s weddings. It’s so much fun to see their planning and ideas come to life, surrounded by their favorite people. It gets me every time. Yep, you read that right. Let’s get to the not-so-obvious areas of importance that go with a wedding day and your pictures. The people (cats), and how those people can positively (or not so positively) impact the wedding day timeline. Don’t let this scare you, but usually, the most stressful element to an entire wedding day are the people involved. Those who surround a wedding couple are typically multi-generational family and friends, gals and guys, and vendors and helpers. To further complicate this aspect, the greater portion of these people come from two separate circles with unique wedding traditions, religious expectations, and family dynamics. Most of the time, the bulk of all of these people will have the best of intentions, but also have varying expectations as to what this day looks like, how it should be organized, and how individual roles play out in the big picture. Your wedding photographer is one of the few vendors of the day that has up-close and personal access to all the key players in your day. It’s important your photographer establishes a good report with everyone involved, effectively communicates the schedule and expectations, and ultimately adapts to the emotion and excitement levels of those key people who are sharing your special day with you. This is an extremely important balance to strike between the consideration of your favorite people and getting the job done. Let’s not forget why we are even talking about this. You’re getting married! As mentioned earlier, the day is filled with all kinds of emotions. Some really big and grand moments but also some private and intimate moments too. Your wedding photographer will be with you during almost all these big and small moments. I never, EVER, take for granted why we are even there in the first place, which is to celebrate your love and commitment. Yes, I have a job to do, however, I will never let my job impede or detract from those once-in-a-lifetime moments. By working together to create a realistic timeline that encompasses everything you are looking for in the way of images, I make sure to build in time for the photography to step back, and be less-intrusive to those intimate moments. I pride myself on this. You can be assured that while you are reading that last love-letter from your fiancé, or reflecting in a quiet moment – I will be tucked in a corner inconspicuously taking photos, but respectfully giving you your space. It’s also very likely I’m crying right along with you. Trust me, it happens every time. Beyond all of this not-so-obvious stuff, let’s get down to one of the main points of hiring a quality wedding day photographer: the pictures. In addition to the planned-for photos, it’s the details, intimate moments, and unexpected surprises that help round out a finalized wedding gallery. My primary goal when you open your photo gallery is to take a walk through the day, and relive the emotions and love you felt just like the moment they were happening! So often, my couples tell me they are most excited about an intimate laugh, or a quick swipe of a tear – and had no idea that moment was captured but it brought them right back to that feeling. Finally, there should be a solid understanding of what kind of wedding photos speak to you and that your chosen photographer has a similar creative style. Dark and moody with lots of contrast or light and airy (which is me – hi!). When you are shopping around, there is a good chance the style of photos you see on the photographer’s website are the same style and mood you will receive. Think of it this way: A watercolor artist is an expert at creating whimsical, dreamy paintings. If you were to hire a watercolor artist and then expect a multi-dimensional, abstract piece of art to display on your entry table in return, well….. let’s just say that there is likely to be disappointment on both sides. At the end of the day, your wedding celebration should be filled with love, excitement, and emotion. My goal is to help achieve this and most importantly, document it. When you relive your wedding day through your photos – you will feel the same feelings you did that way, for a lifetime to come. If you are in the planning stages of crafting your wedding day – let’s talk! I’d love to hear about your big plans, and how together we can make it even more special!